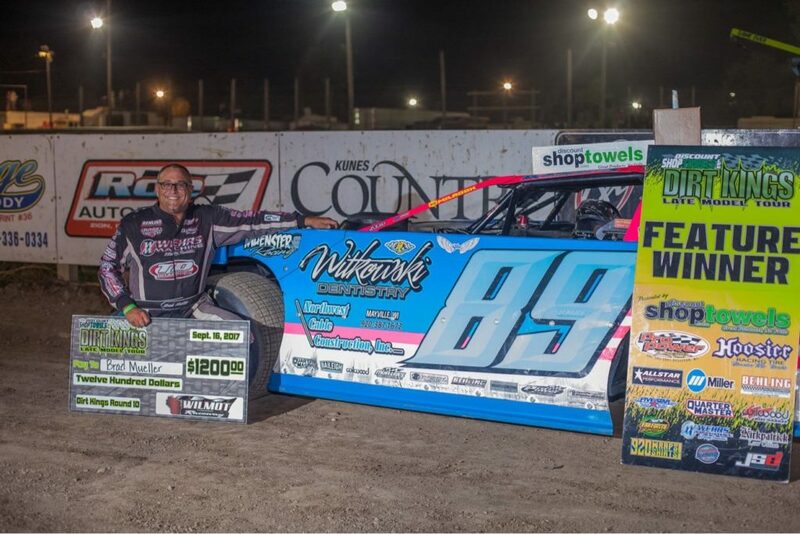 Brad JJ Mueller wins Round 10 of the DiscountShopTowels.com Dirt Kings Late Model Tour at Wilmot Raceway. Mueller started the 30-lap A-Main outside row one and raced side by side with Tim Buhler, taking the lead coming out of turn two on lap two. A caution slowed the field as Brett Swedberg and Buhler battled for second and Troy Springborn in fourth. Mueller had a close call at the halfway point as he tangled with Victor Benedetto but was able to hold on. Caution slowed ...the field before the lap could be completed and on the restart Swedberg, Mitch McGrath, Jim Letizia, Taylor Scheffler and Chris Carlson got together in turn one, bringing out the red flag. P6: 01 - Greg Cantrell Jr.